Three Bit Screwdriver with Hex Driver. 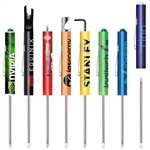 Our 2 in 1 mini screwdriver has a high impact plastic handle, reversible carbon steel & nickel plated blade and pocket clip. Super Tri-Ad Reversible Blade Pocket Screwdriver with pocket clip.